Having a multi-cat household can bring a lot of fun and enjoyment, not to mention great company, but the arrangement isn’t entirely without its problems. Unlike dogs, cats are naturally independent creatures that greatly value their personal space and don’t always appreciate, or need, feline friendships. That said, when a cat’s personal needs are properly met in a household, it can happily cohabit with other cats without too much trouble. When these needs aren’t met, cats can come to blows and start misbehaving, which is why careful consideration is necessary if you want to keep the peace. Gradual introduction: when you bring a new cat into the household, the resident cat(s) can quickly get stressed and upset. This can result in a fierce stand-off if the situation isn’t handled carefully. Ideally, you should let them smell and hear each other before they are physically brought together. Some behaviourists recommend confining the two cats to separate parts of the home so they are aware of each other but not thrown in at the deep end with a sudden meeting. After a couple of days, rotate the cats so they are allowed to investigate each other’s smells before eventually meeting face to face. 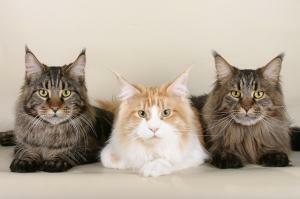 Litter boxes: the general rule of thumb is to provide a litter box for every cat in the household. This is because cats are fastidious creatures that are very particular about where they go to the toilet. If multiple cats are expected to use the same litter tray, they simply won’t, and you will have all the problems associated with litter tray avoidance, including spraying and eliminating on the carpet and refraining from going at all, as well as behaviours connected to stress. Try to place trays in various rooms of the house and make sure they are easily accessible so every cat can find its own. Feeding stations: the same applies for food and water bowls. Community feeding stations are never a good idea and just invite intimidation and bullying, as the dominate cat will try to nose its way to the front of the queue. Like with litter trays, position the feeding stations around the house for your cats to find. A dominant cat can’t be in two places at once so you can rest assured your other cats are getting a look-in at mealtimes. Scratching posts: cats love to scratch and do so out of instinct so, rather than trying to prevent this natural behaviour, try to facilitate it in an appropriate way with lots of scratching posts dotted around the home. Each cat should have its own to avoid competition and fights. Some cats prefer horizontal scratching posts, while others (i.e. older or arthritic cats) may prefer vertical scratch mats that are easier to claw. If you can, try to provide scratching posts that meet your cats’ preferences and in locations that correspond with when they are used. Beds and hideaways: when cats are feeling stressed or simply want to retreat for a bit of peace and quiet, they will look for somewhere safe and comfortable to go. To keep things amicable, provide a variety of hideaways so all your cats have somewhere to call their own. Place beds up high, tuck them into corners, put them on the sofa – wherever your cats prefer to visit. Vertical territory including shelves, window perches and climbing stations gives the impression of lots of space and personal territory, which is essential in multi-cat households.